May, June & September intakes fully booked. Please enquire to join a waiting list. £5,450 excluding accommodation. VAT exempt. Executive coaching has become a significant and influential part of the learning and development strategy of many organisations. This triple-accredited programme will appeal to managers and coaches wishing to improve their personal coaching skills whilst gaining a professional qualification from an internationally respected business school. Our coaching programmes aim to create resilient coaches who will coach effectively in a wide range of scenarios. The in-person workshops give valuable time for practising new coaching skills and reflection. The Henley Professional Certificate in Coaching is accredited by the International Coach Federation (ICF), Association for Coaching (AC) and the European Mentoring & Coaching Council (EMCC); recognising the quality of the programme experience. Your programme fee includes membership of The Henley Centre for Coaching (for the programme duration). This provides benefits such as access to up to 10 webinars a year, networking opportunities, online discussion forums, coaching contracts, research and blogs. The Henley Professional Certificate in Coaching is now available to be studied in-person from each of our campus locations in South Africa, Germany and Finland. Please enquire and apply directly to the campus you wish to be based at. Who is the Henley Professional Certificate in Coaching for? Study is part-time, typically 9 months duration, with 7 days of in-person workshops scheduled over the first 3 months then 6 months of supported study. In-person workshops are held at our Greenlands campus. You will have access to your online learning portal including resources from the Henley Academic Resource Centre. Before Workshop 1 we will invite you to undertake reading, reflection and online learning; this will require around 3-5 hours of study time. A further 6 months of study, including online content (reading, videos and skill-based webinars), plus coach mentoring, coaching practice and coaching supervision. After completing Workshop 3, you will be required to undertake 20 hours coaching practice, obtaining feedback from all clients. A 2,000-word document reflecting on your development as a coach and a 30 minute recording of a coaching session are the basis of the award of the Certificate. The Certificate forms part of the MSc in Coaching & Behavioural Change. Exemptions may be available if you wish to continue your study. See the Henley Coaching brochure for more programme outcomes and benefits. We pride ourselves on understanding the need to create an environment which is both relaxing and comfortable enabling work and study to be focused and effective. From our unique riverside location to our impressive amenities, we provide an ideal environment for meeting success. Balancing busy work schedules with relaxation and exercise is an important aspect of our approach at Henley. The fully equipped and professionally staffed Fitness Centre with views overlooking the beautiful grounds and River Thames has everything needed to restore a sense of well being. At our Greenlands site we provide a variety of meeting rooms and conference facilities. Our rooms have been designed with an emphasis on practicality with many of our rooms benefiting from the latest presentation equipment to ensure that your meeting runs smoothly. The conference rooms at Greenlands, Henley, all feature air conditioning, natural daylight and excellent acoustics, as well as state-of-the-art AV and presentation technology controlled by bluetooth touch screens, free WiFi access, laptop connections, networked PC and large screens. Our larger rooms also have repeater screens. Each conference room has access to dedicated syndicate and break-out rooms and refreshment areas close by. Stationery, flipcharts, photocopying facilities and whiteboards are included as standard. All syndicate and meeting rooms at Henley are fitted with a large screen, networked PC, whiteboards and have free WiFi access and laptop connections. River House 1-14 are also fitted with Copycam, allowing users to capture whiteboard notes at the touch of a button. Digital recorders, video and stills cameras are also available on request. All are laid out boardroom style. We have 100 rooms including some with disabled facilities. All rooms are en-suite & include a safe, trouser press, laptop connection with free Wi-Fi access, direct dial telephone, satellite TV with radio, Molton Brown toiletries, tea & coffee making facilities and a hair dryer. Photograph of Thames Court accommodation. Full English breakfast is served in our main dining room, which overlooks the River Thames. Our dedicated staff maintain the facility 24 hours a day, seven days a week. All guest rooms receive daily housekeeping services. When it comes to dining, we offer you choice, quality and flexibility. We understand that you also want facilities that are conducive to networking, and dining arrangements that integrate seamlessly with the other aspects of your day. Henley is renowned for both its excellent standards of service and the high quality of cuisine. The chefs and their professional staff are able to offer the sophistication of a memorable evening dinner in the spacious dining room, with its views over the lawns down to the Thames. Fresh, varied breakfasts are prepared by award-winning chefs and served each morning in the beautiful, riverside restaurant - the Heyworth Room. Several tea and coffee areas are situated throughout the buildings, the Garden Common Room is situated beside the Heyworth Room and is open throughout the day and evening offering a wide range of Fairtrade drinks and a selection of biscuits. The bar is open each evening serving a full range of drinks. 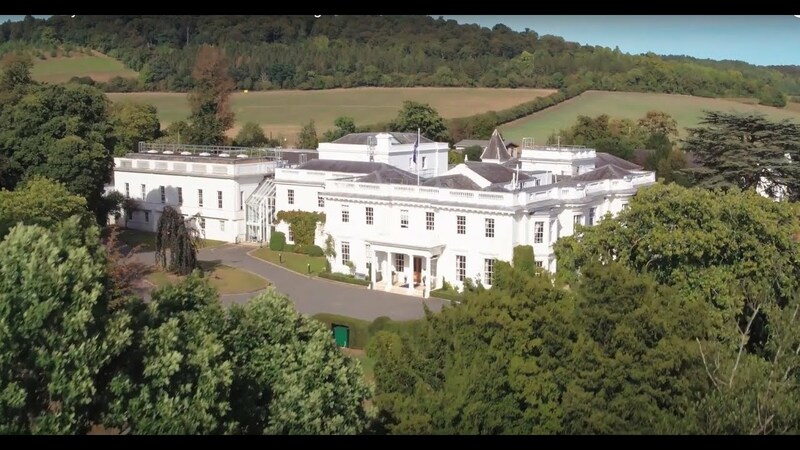 Set in its own 30 acre estate in the beautiful Oxfordshire countryside, alongside the River Thames, this magnificent Grade II Listed Building offers excellent conference, meeting and event facilities and provides a spectacular setting for any gathering. For more information about booking our beautiful facilities please visit the Henley Conferences website. Records indicate that there has been a house on our Greenlands site for 500 years, although the house would have originally been much closer to the river. Greenlands has been home to a series of notable families and individuals throughout its lifetime. These include Thomas Chaucer, son of Geoffrey Chaucer; Robert D'Oyley, Sheriff of Oxfordshire in 1573; Bulstrode Whitelock, Oliver Cromwell's Ambassador to Sweden and most recently WH Smith, who bought the existing house in 1871. Queen Elizabeth I is also known to have visited on more than one occasion, most likely when staying at her royal palace in Reading. The site became the home of a new Administrative Staff College in 1946, first welcoming students in 1948. In 1952, after the unexpected death of Viscount Hambleden from whom the College leased the site, an opportunity to purchase Greenlands' 30 acres arose. The College was renamed Henley Management College in 1991, and following the 2008 merger with the University of Reading became Henley Business School. Today, the world-ranked Henley MBA, The Henley DBA and our executive education programmes are delivered at Greenlands. What is mastery in coaching and how do I get it? What can coaching learn from Pokemon Go? Henley MBA alumni are eligible for 10% discount off the programme fee. All offers & discounts will be displayed here when available. Helping you become exceptional is at the heart of everything we do. The Henley Experience is highly practical, collaborative and academically rigorous. We develop confident leaders and professionals who are able to take a fresh perspective and have the energy, capability and resilience to ensure that they and their organisations are successful. The Henley Experience is much more than a set of principles. It is ingrained in our spirit and fundamental to our purpose and heritage, characterising the way we can help you to deliver exceptional performance. We engage with you at the deepest level, fostering a shared spirit of curiosity, exploration, investigation and learning. We collaborate with you in order to challenge assumptions and mindsets, and get to the heart of the real business issues you face. By creating a safe environment that promotes self-reflection, you are able to ask yourself those crucial questions that allow you to learn more about what informs your strategic business decisions and actions. We work closely with you to diagnose your strategic individual and organisational aims. We then identify programmes that are best aligned to these goals, or we can co-evolve a learning design specifically aimed at achieving these strategic outcomes. We draw on world-class research and originate leading-edge thinking – but theory remains theory unless it is applied to real-world business. All of our programmes are delivered by experienced faculty who integrate academic rigour with commercial application. What you learn translates into business results. Our customers rely on our long history and global reputation for successful executive development. These strengths underlie our responsible and collaborative way of working with you to co-create the very best executive learning experiences and commercial outcomes. At Henley we know we cannot just be exceptional – we are here to help you become exceptional. We are delighted to announce our first coaching scholarship competition with media partner Third Sector Magazine for a full scholarship for the Professional Certificate in Coaching (PCiC) programme at Henley worth £5,450. The scholarship is funded by the Marshall Goldsmith Bursary run by Henley, which is specifically for those working in the not for profit or charity sectors. Henley Professional Certificate in Coaching is running on the following dates. Please select which date would work best for you. If you have any questions, please contact our programme advisor, Rebecca Brown by email at exec@henley.ac.uk or by phone on +44 (0) 1491 418767.